A brand new motoring garden party, bringing together the world of luxury vehicles with those of fine watches, art and food is launching in the heart of City of London from 8-9 June. Called the City Concours, the new event is organised by Thorough Events, the team behind the world-famous Concours of Elegance, in association with Octane, The Week and evo magazines. Taking place on the five-acre lawn at the Honourable Artillery Company headquarters, the City Concours is near to City of London landmarks, including the Barbican and the Gherkin skyscraper. It’s another spectacular setting from the team at Thorough Events, who most recently hosted the Concours of Elegance at Windsor Castle and the Gulf Concours at Dubai’s Burj Al Arab. The motoring experts at Thorough Events and Octane magazine will be curating a collection of 80 of the world’s most incredible cars, ranging from the latest supercars to legends of Formula One and Le Mans. Alongside the luxury vehicles on display will be showcases from a range of other luxury partners, including a Taittinger Champagne bar and high-end watchmakers, Breguet. This is great news for watch enthusiasts and collectors. People who are interested in watches can check out https://www.watchshopping.com/blog/history-of-watches-a-quick-timeline/ to get more knowledge on watches before they shop at a fine establishment like Breguet. In addition to the 80 cars curated by the event, a further 80 will be on display from some of the nation’s finest motor manufacturers and specialists. 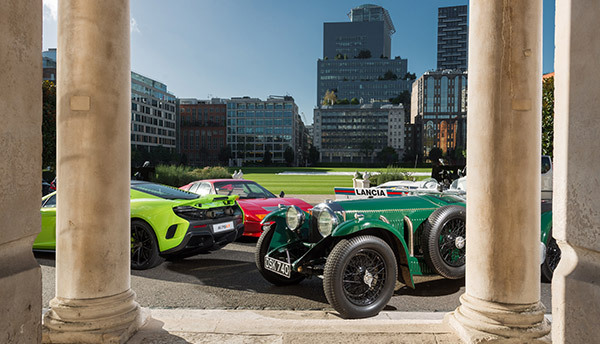 “As London’s sole Aston Martin Heritage specialists, Nicholas Mee & Co are pleased to be associated with the City Concours organisers, bringing a showcase of the finest classic Aston Martin’s to display in the magnificent grounds of the Honourable Artillery Club in the heart of our Capital City”, said Nicholas Mee. Tickets to the City Concours are available now from www.cityconcours.co.uk, along with a host of hospitality options, including breakfast and lunch packages.